Movies made in one’s lifetime, but not seen when they are made, often have a dual effect, and are evaluated in two ways at once – for their intent (story, mise-en-scene, all that crap) and also for the reminders of the time. Darkman is a 1990 horror-action movie that got middling reviews and decent box office, and it spawned a pair of unrespected sequels, much like any semi-successful geek-genre film did at the time. It’s strange how much of the film looks crude today, how some things that would have been de rigueur at the time are astonishing, and how individual and strange it is. 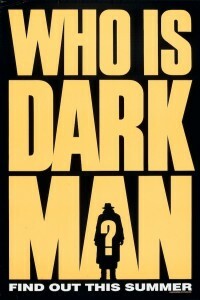 Darkman is the story of a man attacked, left for dead, and wreaking a terrible revenge. It is also about a talented filmmaker coming up against the limitations of the studio system. Liam Neeson, well before anyone had really heard of him, plays Peyton Westlake, which may be the worst name in movie history. He’s a scientist researching a skin replacement. The problem is the skin only lasts for ninety-nine minutes before it disintegrates. The other problem is that his attorney girlfriend has uncovered some information she shouldn’t, about a developer, bribes – crime movie stuff. The developer’s thugs, led by Larry Drake, give Darkman his origin story – burn his hands, melt his face, explode him, kill his Japanese research assistant (who knows martial arts and whom Drake calls “houseboy” – it’s that kind of movie, never farcical but filled with winks). Peyton’s body is found and experimented on in some research hospital, where they sever some nerve center in his brain so he cannot feel pain, and he has adrenalin coursing through his body, and rage attacks. They make a superhero out of him. All of this, of course, is absurd, but it is a specific kind of absurdity. The film was directed by Sam Raimi, with the story by him, and a screenplay by about six other folks. It was his first real big-budget, supervised film production, and the adjustment from independent do-whatever-the-hell-he-wants director to company man was not easy. For all the issues the films has, though, it is remarkably audacious for an attempt at a Hollywood blockbuster. Raimi apes two traditions at once: the Universal movie monster (Darkman resembles the Invisible Man and the Mummy, and was apparently specifically modeled on Doctor X), and the comic book superhero. The 1989 success of Batman began the early trend of comic book movies (though by the mid-90s the poor returns and quality of many of these films caused the trend to peter out until the 2000 renaissance, which continues today). 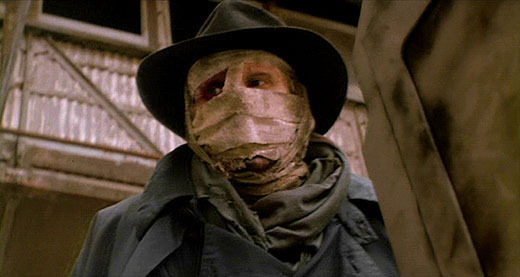 Darkman is a much more successful example of comic book sensibilities put to film. The dialogue is just the right kind of exaggeration. The character’s frustrations are the same kind that the Marvel characters had (work not going so well, girlfriend doesn’t want to marry, superpowers gotten after being blown up by bad guys). Often the image compositions are exaggerated or have foreground elements that jut into the middle of them. The Darkman’s actions have the practicality of a Marvel hero, too. Peter Parker became Spider-man’s exclusive photo agent. Darkman’s schemes are motivated by revenge, but he spends most of his time wearing other people’s faces to steal the mob’s money to fund his schemes. It’s practical, it’s (within the boundaries of the film’s fictive world) realistic. Much of the visual strategy is similar to Raimi’s Evil Dead movies* – low-angle track-in shots on faces, dynamic camera movements. It is similar to the cinematic language Barry Sonnenfeld employed in Raising Arizona, but here the cinematographer is Bill Pope, who would work with Raimi again on Army of Darkness and the last two Spider-man movies, but is perhaps most notable for shooting the Matrix trilogy. This was Bill Pope’s first real job shooting a movie, and I cannot imagine a more interesting or willing partner in visual exuberance than Raimi (except maybe Edgar Wright, who used Pope on Scott Pilgrim and the upcoming The World’s End). *To date, I have not seen Crimewave, which just became available on disc. So I have no idea what visual tricks/strategies Raimi used there. Darkman is the story equivalent of the first six issues of any comic book series – our hero is made, gets his revenge, and finds his life’s purpose (or anti-purpose) and what he’ll have to live without. It would be the beginning of the adventure for any comic book hero (or, indeed, a Universal monster, since they all had scores of sequels themselves). Darkman’s make-up is beautifully grotesque. It puts to shame the Two-Face CGI creation from The Dark Knight**. And, as should be the case with a good movie monster, we do not see the make-up in full until the last third of the film, when Darkman is at his most vulnerable. **That effect has a great design, and works superbly in the emotionally climactic sequence of the film, when Two-Face and Gordon and Batman hash out their final differences. But despite one terrific gag (when Two-Face takes a shot of bourbon, and a good amount of it slips out the burned cheek), the effect is too clean, too settled. Too CGI. The key to the film’s quality is this vulnerability. What Peyton really wants is to get his fiance back. He wants his life, but he can only get it in ninety-nine-minute segments. His rage and his love pull at him. At film’s end, he makes the superhero’s choice – his powers make him dangerous and strong, too dangerous and strong to put his loved ones at risk. Darkman is alone. 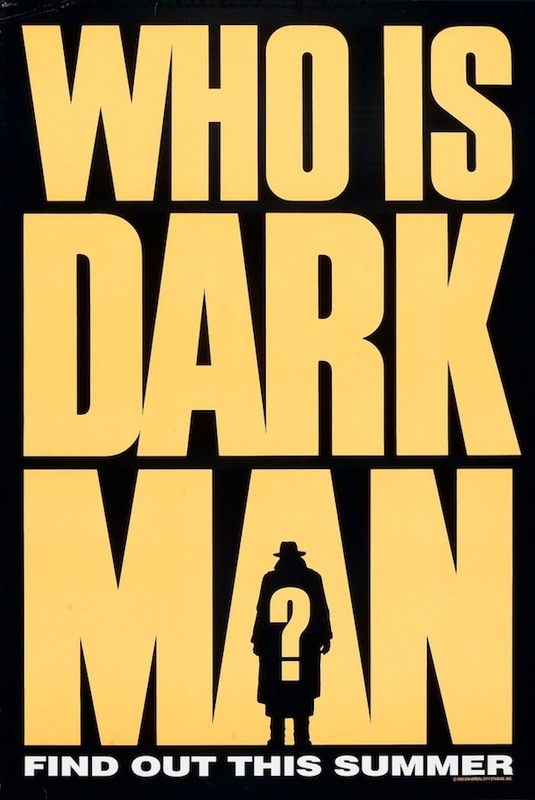 While Darkman is a highly enjoyable film, there are a number of things one must keep in mind when approaching it. It is twenty-three years old. Some of it looks over-lit, some of the camera movements are more obvious now and feel less inventive (though part of this stems from Raimi & Pope’s work in altering the way all movies look). The villains are broadly drawn, and their background is left literally in the background. There is no sympathy for the devil in Darkman. It doesn’t explain why the bad guys are what they are. Like Darkman’s faces, the movie’s plot is on the surface. It is also much smaller than the villainous plots we’re used to these days. The bad guys are mafia types, musclemen who shove people around. No crazies, no magic gas that will turn everyone else into billionaire real estate developers. Just greed and malice. One sequence (that rarely happens in film today) astonished me. In the penultimate action sequence, Darkman fights the bad guys in his abandoned factory lair (and where would comic book antiheroes and mad scientists be if people didn’t abandon factories left and right? ), and the fight, as fights do, ends up on a helicopter***. Darkman dangles from a hook on a long chain attached to the copter. It’s a real stunt. A real human being, dangling from a real chain. No CGI fakery. No frigging models. Real death-defying stuff. For five minutes I felt I was watching a Buster Keaton film. I couldn’t believe a real human being was doing this. ***According to this site, the helicopter also had a guest spot in MacGyver, and crashed while taking aerial shots of Katrina. So long, Darkman helicopter. Ironically, in Raimi’s tribute to the lost filmmaking of yesteryear, the Universal horror picture, he has created his own example of lost filmmaking. And it says so much about Darkman‘s aesthetic and Raimi’s ethic (then) that one of the great pleasures of watching this film is seeing all of its old-school effects and stunts. An example: There is a shot of Darkman typing at his computer console. One hand is covered in fake skin, the other is scarred, destroyed. It’s a stop-motion effect, and it is less fluid and more stilted than any computer effect. But it is beautiful. The effect lets me fill in the gaps, lets me create the reality in my imagination. More than anything, I believe that is what the pre-CGI era has above today’s filmmaking ethos. In order to let the magic in, you the viewer have to do a little of the work in your own head. Like Billy Wilder said (in an admittedly different context): Let the audience add two plus two. They’ll love you forever.